Click numbers at right to view more pages. 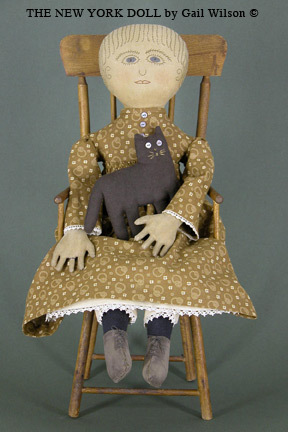 In 2009, I did a pattern for a new cloth doll for an Australian magazine (also sold in the US) called Homespun. 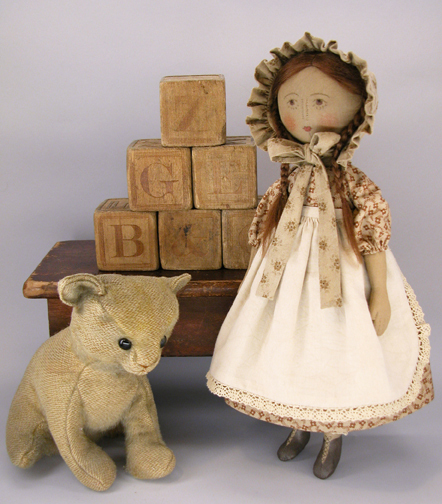 The doll is named Lottie and is 10", all cloth with embroidered face and a mohair wig. This doll has one of my best patterns yet for a cloth doll body and reverts from a painted detail face to stitchery. Finished Dolls no longer available. with Her Sewing Pocket and Strawberry Emery. This cloth doll is in one of my favorite pattern styles that produces a well rounded three-dimensional body if stuffed properly. The usual difficulties encountered with face painting are completely eliminated by the use of an iron-on transfer followed by the use of colored pencils, all of this on a pre-painted skin surface. Likewise, the trickiness of hairstyling is made simple by making a snood for her, which adds to her historical charm and eliminates styling. 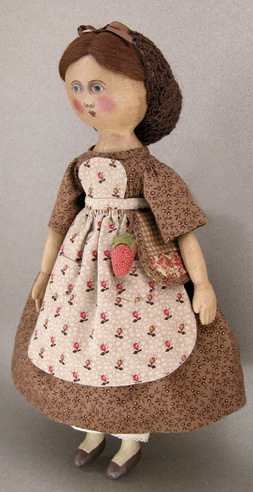 Her 10" size is perfect for the dearness of small while still being large enough for detail allowing her to have her own strawberry and sewing pocket hanging from her pinner (it was the custom to actually pin apron bibs to one's dress instead of being held up by neck ties) bib apron waistband. Complete instructions for making either a simple netting snood or a hand crocheted one are included or you can even order one handcrocheted for you. 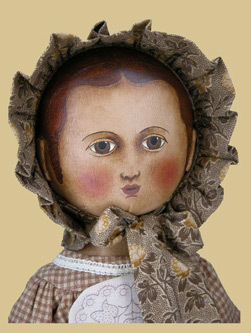 Unlike my early folk style Izannahs whose heads are sewn and stuffed stockinette (now discontinued), I wanted a doll body whose head would provide a canvas for a portrait style painting of her beloved face with corkscrew curls and downcast eyes. For this I wanted flat weave cloth for the whole doll and a separate shoulderplate. This doll is taken from an actual historical example wearing just this same outfit. The period dress with cotton battenburg trim and the printed apron are all part of the kitted supplies. The pattern by itself has instructions for making an apron from other fabric or a pre-printed apron can be ordered below. This is the best pattern I have ever presented. The shape is wonderful and has been long and hard in the making. I am working on (still) a molded cloth face Izannah, but I wanted one that had the charm of simple painting that could be achieved without complicated molds. PATTERN $18 Add to Cart (Aprons sold separately). NEW Bonnet Pattern available - see info at left.